Oral presentation of this web page. The hot water heating circuit speaks to what is a hot water heating circuit and how does a hot water heating circuit work within a building. The heating circuit water flow is designed to match the required flow rate of the mechanical components and the boilers. 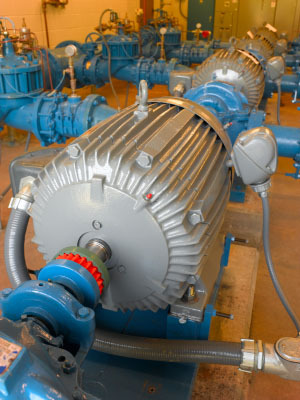 Pumps are now usually installed with circuit balance valves (CBV) at the discharge of the pump. The valve allows water flow to be measured and balanced to design flow rates. The pumps must be in operation for the boilers to fire. A bypass automatic control which senses the differential pressure between the supply and return line may be provided to maintain a constant pump head pressure at the circulating pumps. A control positions a normally closed two port pneumatic valve to the open or closed position. It answers to increases or decreases in differential pressure in the heating system. The fluctuations in system differential pressure are a result of the opening and closing of two way control valves throughout the building. The increased pressures developed at low heating demands must be throttled as control valves open and close causing objectionable noise. The bypass control valve should be located in the crossover pipe between the supply and return water lines on the discharge side of the circulating pumps and the boiler return. The primary and secondary circuit heating water expansion tank allows for the fluctuation in the volume of water in the system as the water temperature changes. Under normal operating conditions the tank level should not rise above the top or drop below the bottom of the sight glass. The sight glass is mounted on the side of the expansion tank. circulating pumps ensuring air is not drawn into the system. it saves wear and tear on the pumps at start up. pressure regulating valve. One side of the system is piped to the domestic cold water system and the other is piped to the heating water expansion tank at the suction side of the circulating pumps. If the PRV malfunctions and allows more makeup water into the system than necessary, then the pressure relief valve will open and allow the system to drain until the excess is released. The relief valves are each set above the system design operating pressure and should not be adjusted. The shut off valves are used to isolate the PRV should it ever malfunction. The bypass valve may be opened manually to add water whenever the level drops too low or until the PRV is repaired and put back into service. Double check valves are provided at the domestic cold water line connection to the pressure regulating valve to prevent chemically treated water from entering the cold water system, in the case of reverse flow. Chemicals necessary to treat the heating water may be added to manually or automatically. It is usually a manual function in most applications. However, on more sophisticated systems water may be automatically tested and chemical added automatically. The chemicals my be added to either the heating water supply or return line. It is suggested that chemical tests be performed on a weekly basis to determine chemical concentration and that conditions be maintained as directed by a chemical treatment specialist. 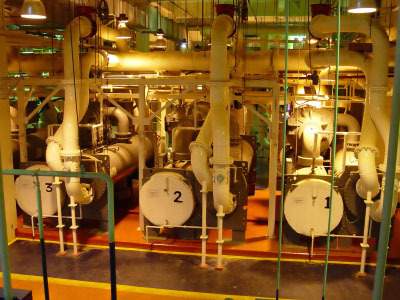 Chemical treatment is necessary to inhibit rust and corrosion of the water side of all heating water components.